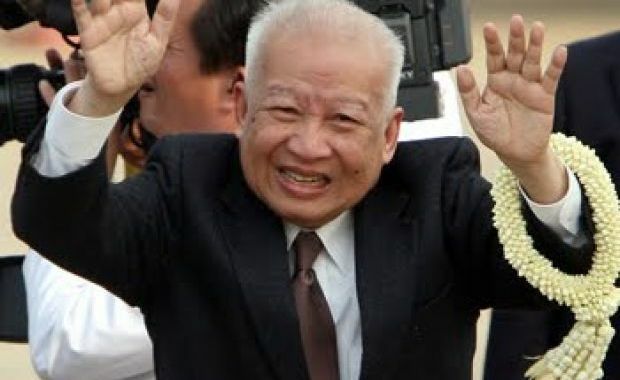 Norodom Sihanouk, the former Cambodian king who was a key figure through decades of upheaval, has died aged 89. The former king died at a hospital in the Chinese capital, Beijing, after having a heart attack. He had been in poor health for several years. Norodom Sihanouk, who was 89, came to the throne in 1941 and led Cambodia to independence from France in 1953. Despite long periods of exile and his abdication in 2004 due to ill health, he remained an influential figure. Norodom Sihanouk abdicated in 2004 in favor of his son, King Norodom Sihamoni. “His death was a great loss to Cambodia,” said his assistant and relative Prince Sisowath Thomico. His body is expected to be returned to Cambodia for an official funeral at the royal palace in Phnom Penh. King Sihamoni is flying to Beijing to accompany the late king home, a Cambodian government spokesman said. A statement from China’s foreign ministry hailed Sihanouk as a “great friend of the Chinese people”. Born in 1922, Sihanouk was the eldest son of King Norodom Suramarit and Queen Kossamak. Educated at French schools in Saigon and in Paris, the Nazi-controlled Vichy government in France crowned Sihanouk king of Cambodia in 1941, bypassing his father in the hope that the 18-year-old could easily be manipulated. However, after the war Sihanouk embarked on an international campaign aimed at ensuring independence for Cambodia. It was achieved without bloodshed in 1953 – after nearly a century of French rule. Two years later Sihanouk abdicated in favor of his father and became both prime minister and foreign minister of his country. Norodom Shihanouk tried – but failed – to keep the country from the Cold War conflict that engulfed South East Asia in the 1970s. When a US-backed coup installed Lon Nol as Cambodia’s leader, Sihanouk – by then alienated by US bombing raids on Vietnamese communist guerrillas inside Cambodia – was forced into exile in Beijing. It was from there that he struck an ill-fated deal with the emerging Maoist rebel force, the Khmer Rouge. When the Khmer Rouge seized power in 1975, Sihanouk returned as head of state but was subsequently detained. Norodom Sihanouk remained confined to the royal palace for most of the four years of the regime’s rule, during which time an estimated 1.7 million people died. People were killed or worked and starved to death, as the Khmer Rouge emptied cities and forced Cambodians to work on the land. Nrodom Sihanouk later condemned the Khmer Rouge for the deaths of the Cambodians, including of several of his own children. When Vietnamese forces ousted the Khmer Rouge, Sihanouk went again to Beijing. He was to remain outside the country for 13 years, as Cambodia faced civil war and the struggle to rebuild from economic devastation. When the UN in 1991 persuaded the Vietnamese to withdraw and set Cambodia on the road to democracy, Sihanouk returned, and was again crowned king in 1993. His role was increasingly one of broker between Cambodia’s warring political factions. But as the country slowly worked its way towards political stability, Sihanouk’s health steadily worsened. In 2004, he announced he would step down in favor of one of his sons, the little-known Norodom Sihamoni. The former ballet dancer was crowned king in October 2004. After that, Norodom Sihanouk spent much of his time overseas, in Beijing and Pyongyang. But he remained a prominent national figure who – although criticized as autocratic and elitist, and blamed by some for his initial endorsement of the Khmer Rouge – symbolized constancy through Cambodia’s years of violence.